"I CHANGE by raising awareness of the people of Kiribati and others who will have to migrate from their homes because of climate change." Imagine standing on the beach of a tropical island. You feel the warm sand between your toes. You smell the salty breeze and hear the swaying leaves of coconut trees. You see the turquoise water of the lagoon in front of you. It is beautiful, isn’t it? You then turn 180 degrees and see the open ocean only a hundred meters away. You look all around and observe that the land is only a few feet higher than the water. It is worrisome, isn’t it? You are on a coral atoll, and in this age of climate change and rising seas, it is a scary place to be. From 2006 until 2008, I lived on one of the coral atolls that make up the Republic of Kiribati, located in the Central Pacific Ocean. I was there to do Health and Community Development work with the United States Peace Corps. During my time in Kiribati, I was amazed by the friendliness and hospitality of the people—although most had few possessions and little money, they welcomed me like a member of their own family and gave me as much as they could offer. I lived with a family that “adopted” me, I made many friends, and I met the woman who I would marry. Although I now live on the other side of the world in the U.S., I am still strongly connected to my family and friends in Kiribati. Kiribati is a beautiful country, but its future is in jeopardy because of the impacts of climate change. The rising ocean, in particular, is making it difficult for people to get by. Many wells have become brackish, plants people depend on for staple foods—like breadfruit, coconuts and taro root—are producing less, the ocean is eroding the land, and the high tides are getting higher and flooding people’s homes more often. At some point in the future, the people of Kiribati will have to leave their islands and look for homes elsewhere; most of them will have nowhere to go. There are many people around the world who are facing uncertain futures as the people of Kiribati are. Rising sea levels and other impacts of climate change are displacing people and will do so at an increasing rate if we do not slow down climate change. 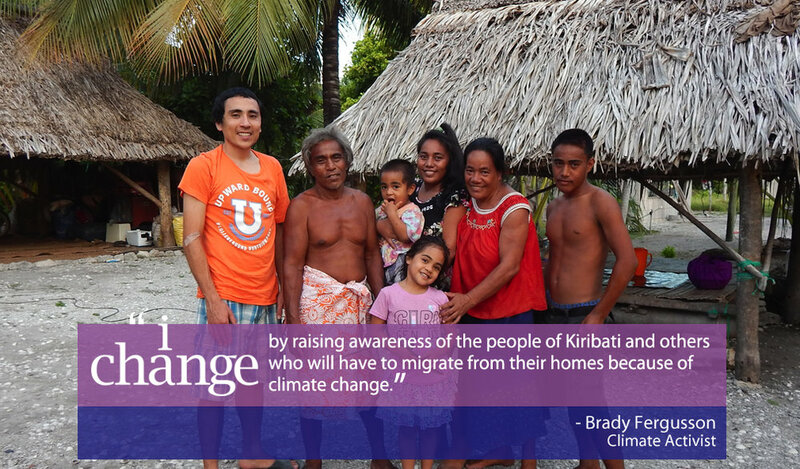 I have made it my mission to raise awareness of the people of Kiribati and others who are becoming climate change migrants. By giving presentations at public and private events, contacting elected officials, and using social media—Twitter and Facebook, especially— I am working to get people to know about climate change migrants and support action to mitigate climate change and facilitate the migration of people displaced by climate change. I believe that when more people understand how climate change is hurting other humans, more people will be ready to act.